In 2012, Feel So Good became the first Korean horse to win a race in the United States. Last month, Seoul Bullet set a record of his own, albeit a rather less auspicious one, as he became the first Korean-bred horse to get claimed out of a race. 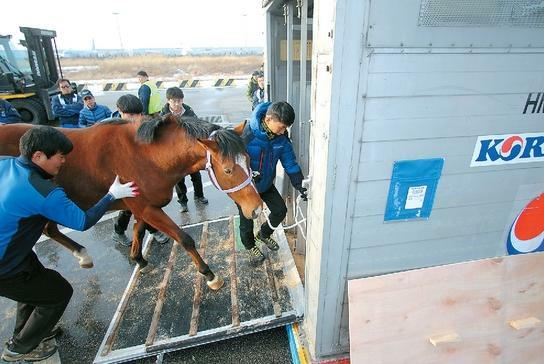 Seoul Bullet (Peace Rules) is one of three horses who left Korea over a year ago for initial training and racing in the US as part of a program that the Korea Racing Authority (KRA) has been running for three years now. The gelding made his racing debut at Gulfstream Park on December 8 last year and finished a very creditable 3rd of eight over six-furlongs in a maiden claiming race. His 2nd start came in January, also at Gulfstream in slightly better company ended in him coming home 6th of nine. Next up he was dropped back in at the same track in race 4 on February 7, with a claiming tag of $20,000. He ran poorly, finishing 5th of 6, however, to general bemusement, he was claimed by Marco Thoroughbred Corp. and found himself on the way to the barn of trainer Bobby S. Dibona. Neither of the other two horses Stateside, who like Seoul Bbullet, are with trainer J. David Braddy, have had a hugely eventful time. Gangnam Camp (Forest Camp) has managed no better than 7th in three starts to date while Better Than You (Ft.Stockton) grabbed 4th on his debut but has struggled in two starts since. Just like Feel So Good and all other Korean horses who run in the US, the three are scheduled to be auctioned off to Domestic owners when they return to Korea later this year. And the KRA needn’t call off the auction just yet. On February 23rd, they claimed Seoul Bullet back out of race 3 at Gulfstream for the same $20,000 tag. The sum total being a fortnight’s worth of stable and training fees saved. * The Gulfstream Three aren’t the only Korean horses in the US at the moment. Up in Maryland, 2013 Derby winner Speedy First and Minister’s Cup winner Major King have been enduring one of the coldest winters in memory at Laurel Park where they are expected to begin a short campaign of racing later this month.